Too small. If you've been told that you need more power or your circuit breakers are flipping off or fuses are blowing. Click here for panel size information. Unsafe. If you have fuses or an older electrical panel. Click here for panel safety information. If you think of your home electrical system as having branches and twigs like a tree, your electrical panel is the tree trunk. 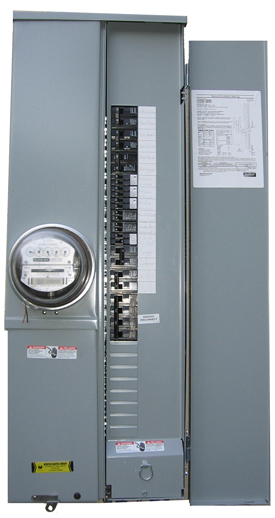 The power from the electric utility company flows through large wires to your home and into the panel. From the panel, the current flows into major electrical branches, which dwindle into smaller and smaller branches and twigs, serving every part of your home. If too much power were to flow into the wires in your home, they could melt. Fires could start. If you were to accidentally touch a damaged overloaded wire, you could receive an electrical shock. To prevent more electrical flow than the wires are designed for, your electrical service panel is supposed to detect the problem and stop the flow (break the circuit). In older electrical panels, a fuse blows. In newer ones, a circuit breaker flips off. Properly functioning circuit breakers (or fuses) are vital for your safety and the safety of your home. Your electrical panel also needs to be big enough to handle your family's electrical needs. If you add a room onto your home or add central air conditioning, for example, you may need a bigger panel to handle the increased electrical load. This is called a "panel upgrade" or "service upgrade." Is my electrical panel too small and should it be upgraded? When you add central air or a large new refrigerator, your home doesn't automatically provide the additional power you need. If you're often flipping circuit breakers or blowing fuses due to too much electrical demand, you may need to upgrade your electrical panel. Adding an oven, hot tub, spa, power equipment in your garage, etc. Older electrical panels have fuses rather than circuit breakers. In the days when fuse boxes were installed, homes needed considerably less power. Many fuse boxes were designed to handle 30-60 amps of power whereas the appliances and electronics in today's homes often require 100-200 amps of power or more. Today fuse boxes may frequently be overloaded, blowing fuses and shutting down your appliances. This can be a big inconvenience! There's a temptation to increase the size of the fuses so that they won't blow so often. But, oversized fuses can allow overloading and overheating of wires, creating a fire hazard. Occasionally, someone will have put a penny in the opening to replace a blown fuse. This can really create a fire hazard because a penny won't break the circuit if it's overloaded. A little known danger of fuse boxes is that homeowners can accidentally stick their fingers into the fuse opening, possibly while changing the fuse, and be electrocuted. The safe solution is to upgrade with modern circuit breakers. Federal Pacific Electric Company (FPE) installed millions of their "Stab-Lok®" model electrical panels from the 1950's to the 1980's. These models have design and manufacturing flaws that can result in fire or shocks. The following is an excerpt from a report to the U.S. Consumer Product Safety Commission by Dr. Jesse Aronstein, a Consulting Engineer, "The presence of a Federal Pacific panel in a home should be classified as a 'Safety Defect. '...There is no question but that the Federal Pacific Stab-Lok® panels should be replaced. There is no practical and safe alternative." The State of New Jersey brought a successful class action lawsuit in 2005 against FPE for safety violations in the testing and manufacture of their Stab-Lok electrical panels. If your home has an FPE Stab-Lok panel or you're wondering if it does, give us a call for a free consultation. Zinsco electrical panels have not been manufactured since the mid-1970s. These panels have design flaws that allow circuit breakers to melt so that they no longer function. Another problem is that circuit breakers may appear to have flipped off when they are still allowing power to flow. Zinsco panels represent a fire and shock hazard and should be replaced. If you have a Zinsco panel or are wondering if you do, give us a call for a free consultation. Pushmatic electrical panels have proven to be unreliable. Over time, as the breakers flip off, they become more difficult to re-set. Sometimes, they flip off simply because they've become weak and won't stay in place. Many Pushmatics also lack a main breaker. A main breaker stops the flow of electricity when too much power is flowing into the panel as opposed to a circuit breaker, which protects a single wiring circuit. Today's panel boxes are equipped with main breakers for this situation, but many Pushmatics lack this safety feature. These names all refer to the same thing: the box which feeds power through the wires in your home and which also holds the fuses or circuit breakers that prevent circuits from becoming overloaded. If you suspect that your electrical service panel is not providing your home with sufficient power or may be unsafe, give us a call for a free home safety consultation.